The self declaration form is the place where you will be declaring all the details regarding your whereabouts, such as your age, your present residential address, and your annual income statement. All this will then have to be attested by you. Under the self declaration form of PMAY you will have to fill out your personal details and apply for the loan under the PMAY scheme. It is only for those whose annual income is below the taxable unit and who come under EWS or the LIG. The self declaration form notifies the concerned authorities about your situation and it is your plea for availing the PMAY benefits. This form is the statement of your belongingness to the EWS or LIG groups so that you can rightfully avail the benefits. The self declaration form is basically an application form for the PMAY. Filling out wrong details in the PMAY form can lead to rejection of your application. Also, the authorities can take legal action against you if deemed fit – upon finding that the information provided by you was wrong. By reinstating your financial details in the form, you are declaring that your annual income is below the taxable unit and that you qualify under EWS and LIG categories. This is important because the PMAY is mainly focused on providing housing resource to the lower income groups. If it is found that you satisfy all the criteria of the EWS and LIG categories, you will be provided the benefits of this scheme. How to get Self Declaration form ? You can get it from your nearest PSU bank or download it online. Also, many more housing schemes will be launched under the PMAY scheme by the different states and Union territories. These application forms will be to avail the loan directly. 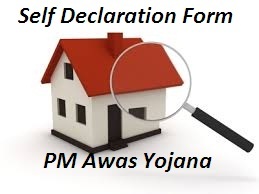 1 What is Self Declaration form under PMAY? The form is the place where you will be declaring all the details regarding your whereabouts, such as your age, your present residential address, and your annual income statement. All this will then have to be attested by you. 2 Why it is important in PMAY? It is important because this form is the statement of your belongingness to the EWS or LIG groups so that you can rightfully avail the benefits. 3 How can candidate get this form? You can get it from your nearest PSU bank or download it online. My Name is Devashish Verma. I live in Kolkata.I need home under Pradhan Mantri Awas Yojana.Please help.